When I was in college, I remember hearing about research done on alpha brain waves, and the discovery that throwing clay on the potters' wheel produced a very high level of them. 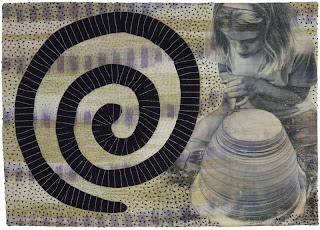 She posits that there is a distinct link between weaving and an altered state of consciousness, and that some of the images produced during this handwork are entopic images, produced directly from the subconscious. So, for my symbol I chose a spiral to represent the hypnotic effect of working on a wheel, also including an *ancient* picture of myself doing same. 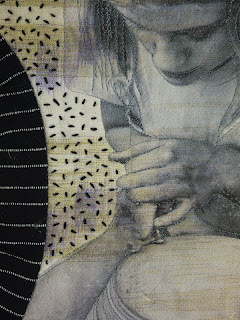 The material used is handwoven, and the quilting is by hand, all meant to reflect the traditional labor involved in this work, which is also deeply connected to the images produced. Betty, I'm not surprised. Undoubtedly, Ms. McCormack would observe the same thing about knitting, embroidery and hand quilting. The 'Zen', the 'Zone'...you have depicted this beautifully. Thank you! Your symbol is mesmerizing; I feel like I've entered a serene, sacred place. 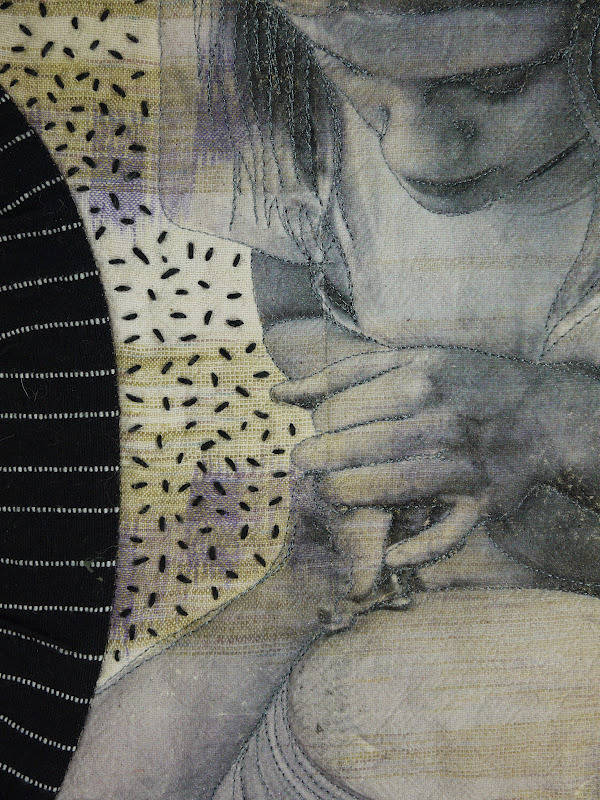 Love how you have tied the elements together on the hand woven fabric Betty. These symbols we have created are personal yet universal. Your creation that is "deeply connected to the images" certainly resonates. Very thoughtful. .. and thought provoking. Hmm, I wonder if that is why certain images emerge in multiple cultures, independent of outside influence.....some pulsing shape in the human psyche? Love the composition. I've been in the "zone" many times and the spiral depicts that state of being perfectly. Love the image!